Make Your Comics Look Classy! Libraries have been using this process for decades with their periodicals. 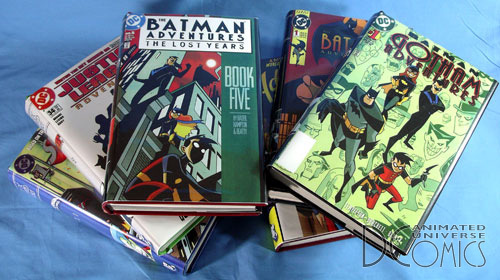 The idea has spread amongst comic collectors in recent years, most likely in parallel with the development of the internet. Many places around the world offer this service. Since I’m Texas, I had used a place out of Waco. This allowed me to drive the books to and from, and save a lot of money on shipping. Sadly, I just learned that firm was sold to Houchen Bindery Ltd. out of Nebraska. I can’t speak for these folks, but I just sent a book to them to be bound, so I’ll report back when I know more. As you can see from the link above, Houchen Bindery offers many options. They’ll even print and adhere cover art. You can get custom metallic stamping. Lots of ways to spend money! I chose to go with the basic, no-frills options, as I planned to make my own dust jackets, making all those extras superfluous. Preparing the comics is easy. I prepared each book as a stack, included my custom title page and table of contents, then sandwiched the stack between two pieces of cardboard and bound with twine. I filled out the downloadable PDF order form, then mailed everything in. 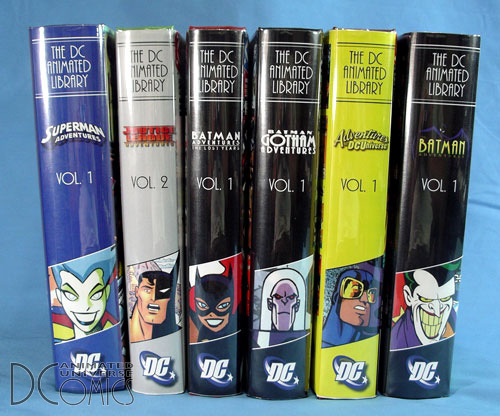 I broke the entire DCAU run into 18 books. I doubt it could be made with fewer books. At $21 a pop plus shipping both ways, that can be pricey. I recommend building the collection over time. 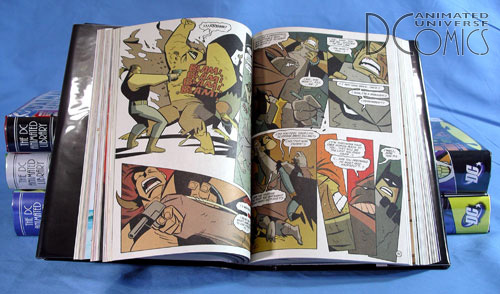 If anyone would like PDF copies of my cover pages, tables of contents, or dust jackets, just let me know. If there’s enough demand, maybe I’ll post them here for easier access. Oh, and I always cover my dust jackets in clear acetate, just like the libraries do! Most people who do this do so because they love the issues, not so much for the money. 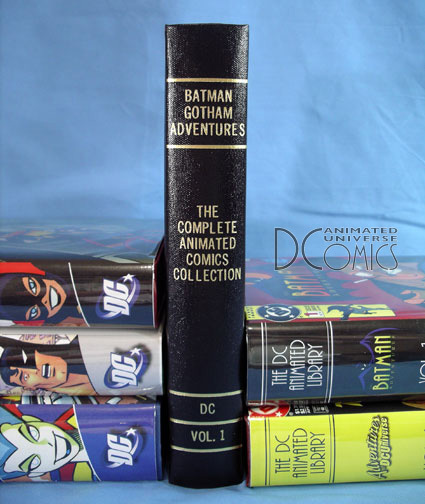 But I have read that those who turned around and sold the collected editions got far more money than the usual value of the issues. So it may actually boost the value. about how many issues fit in a book? I guess it looks like as many as you would like…what binding method do you use? I think the limit is however many as you can fit inside a collected width of 2.5 inches. As far as method, I use the bare bones options. Nothing fancy. Why would anyone review 20-year-old comics?